I think I jinxed myself when I talked about all of the steady progress I was making. It’s been a busy week. Well, I did manage to get the background on one flower from the third row. Not much, but better than nothing. Seeing the back remind me that I like a slightly bigger than 1/4″ seam allowance, which I think will make buying a die cutter (and die, obviously) difficult. None of them (that I’ve seen) are going to give me the 3/8″ seam allowance I’m more comfortable with. 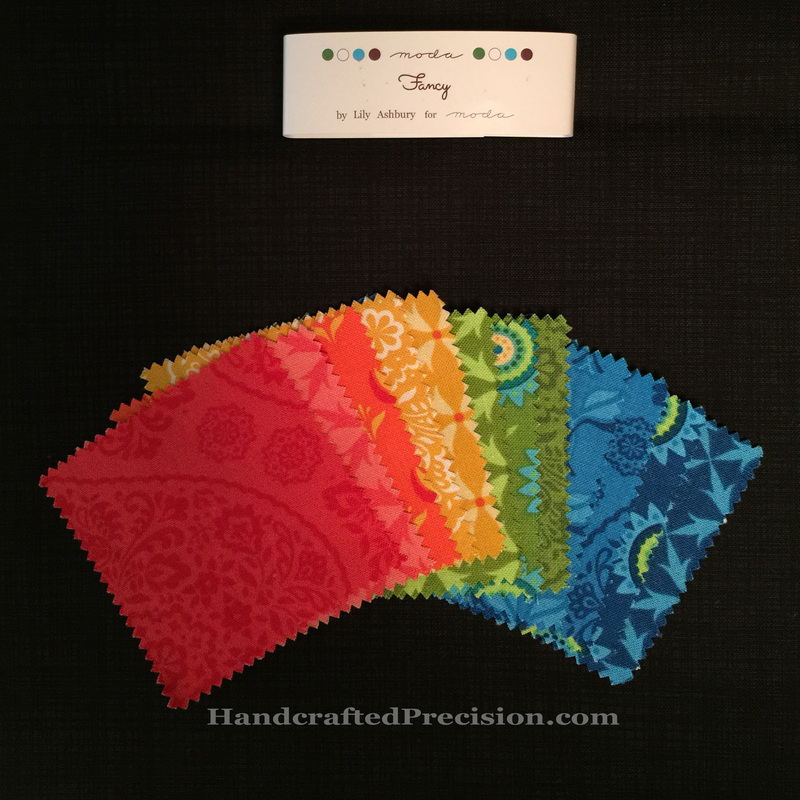 If you know of a die cutter with suitable dies, please let me know in the comments! Thanks in advance. 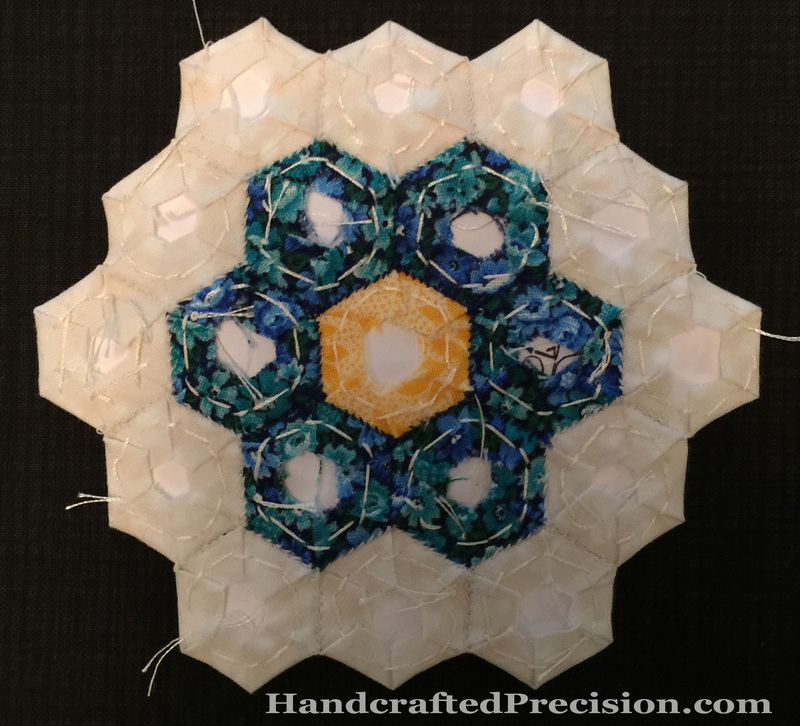 This entry was posted in English Paper Piecing, Grandmother's Flower Garden, Hand Sewing, Hexagons and tagged Tiny Flower Garden on December 28, 2014 by HP. Sec, my toddler, has decided it’s time for him to move out of his toddler bed and into a bigger bed. I should have worked on his toddler bed quilt more. Now it’s going to be a twin-sized quilt. I’m a little sad I couldn’t make it for him faster, but I’m happy because he’ll get more use out of a twin-sized quilt. Also, I get to make more bigger pumpkins and/or use a lot more floaty white-on-white background for a more modern look. 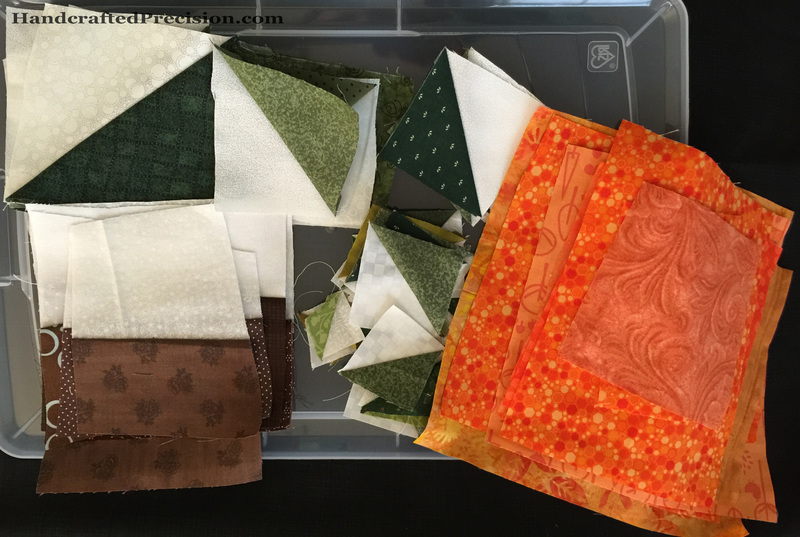 I haven’t decided yet, but I’m leaning toward more pumpkins (or maybe adding some machine-appliqued leaves), since too much white on a little-kid quilt is asking for trouble. I have a cut a bunch more pumpkin bodies, leaf units, and half-stem units (they need background on the other side). I also have a stack of various-sized white-on-white print pieces. I’m all ready to get going on this again in the new year, and I plan on powering through until it’s done. I need to get a cabinet for my sewing machine so I can take advantage of fifteen minutes here and there during the day (Ter’s naptime, after the kids are all asleep, etc.) to sew. I’m browsing cabinets and sales now. This entry was posted in Machine Piecing and tagged Pumpkin Patch on December 24, 2014 by HP. No exclamation point this week, but I have the second row sewn together. Sorry about the shadows. I definitely need better lighting. This project is still very portable (remember that these hexagons measure 1/2″ on a side). I didn’t attach the single hexagon green “leaves” because I have them all oriented a certain way and it would be a pain to mark them and bring green thread. I’ll do them all at the end. And I haven’t decided about that green gingham one yet. I’m making slow and steady progress, which is great. I’m not looking forward to doing the applique to the borders, though. 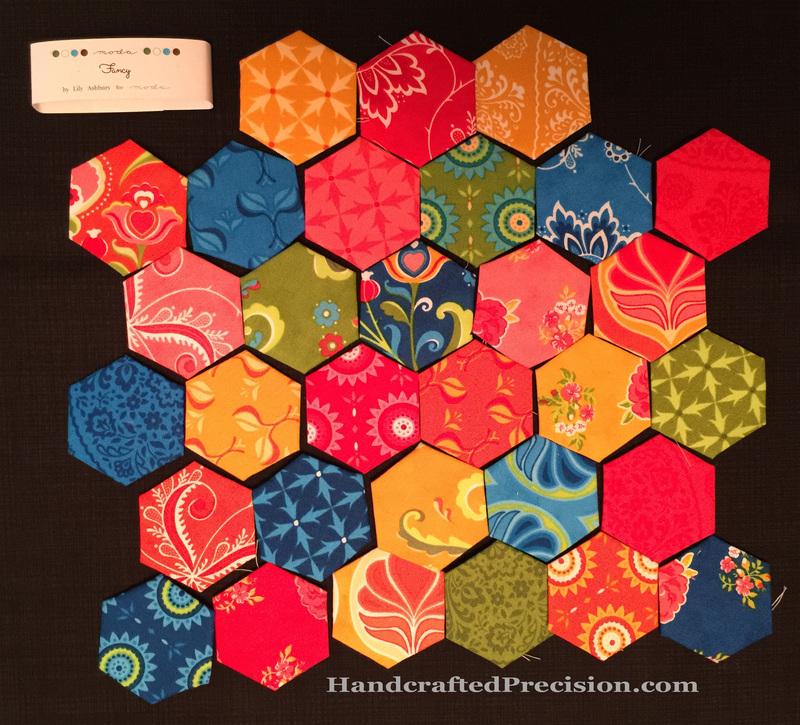 This entry was posted in English Paper Piecing, Grandmother's Flower Garden, Hand Sewing, Hexagons and tagged Tiny Flower Garden on December 14, 2014 by HP. Over the past couple of weekends, we spent a lot of time in the car. 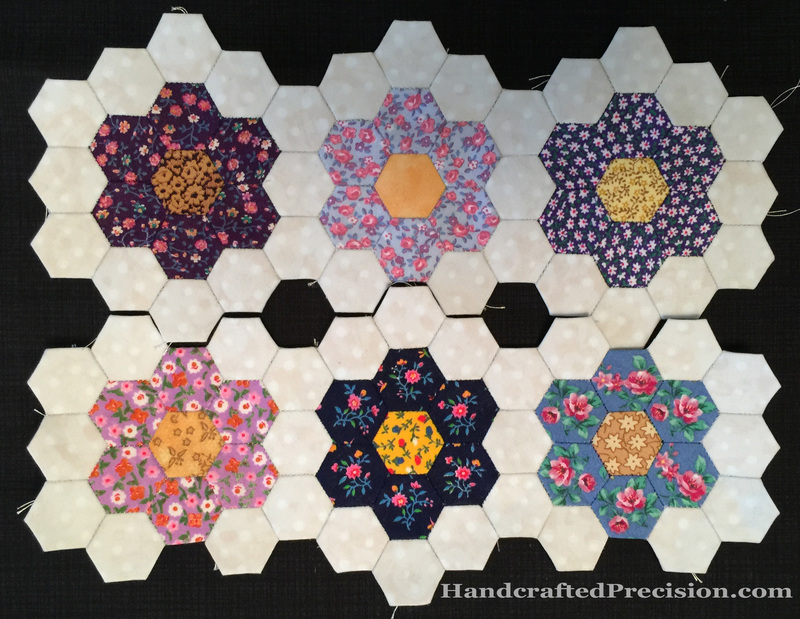 I didn’t have to drive, so I spent the time sewing background hexagons to flowers and joining the first row of Tiny Flower Garden (sans green “leaf” hexagons, hence the “almost” in the post title). I’m so excited! It’s actually starting to come together and the more time I spend with it, the more I like it. I wonder if that’s because of the work I’m putting into it–or maybe it’s just that I didn’t expect much from this project, but I’m learning a lot. I actually got halfway on joining the second row, but I’ll save photos of that until it’s done. Soon, I hope. To facilitate the “sewing while traveling” thing, I got a thread cutter pendant like I’d made fun of in the past. I’m officially an old lady! Joking aside, it worked really well. I’m not used to wearing necklaces (and I had to wear a necklace of braided threads since I forgot to order a metal chain), but it was much less of a pain to wear it and use it than to unsheathe my tiny sharp scissors every time I needed them. Because I was sewing instead of basting, I didn’t need them too often. 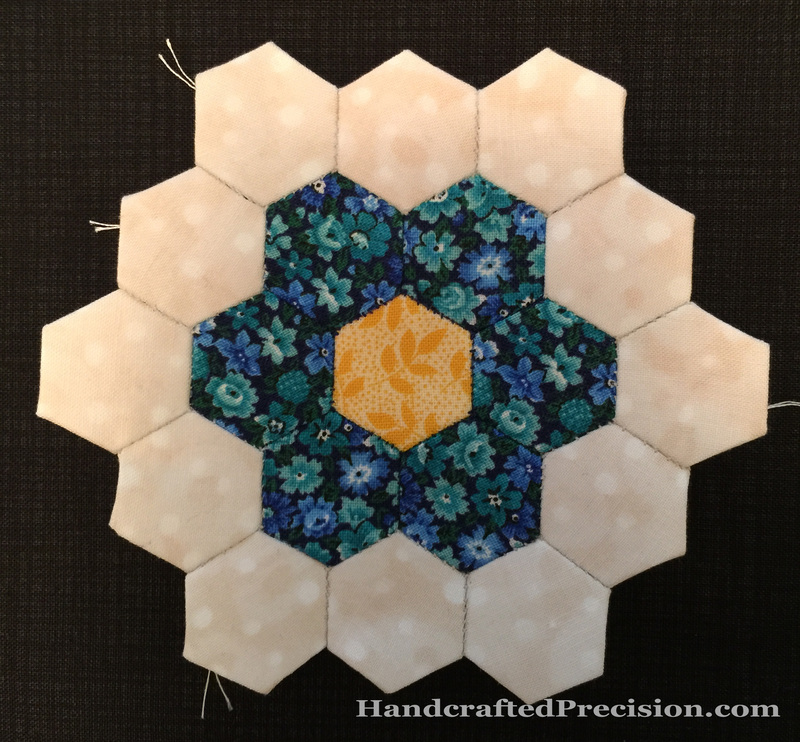 This entry was posted in English Paper Piecing, Grandmother's Flower Garden, Hand Sewing, Hexagons and tagged Tiny Flower Garden on December 7, 2014 by HP. I love how it’s packaged and I know my fabric will stay flat and clean until I use it. This set is looking a little beige and drab and old-timey, but that’s nice sometimes, too. 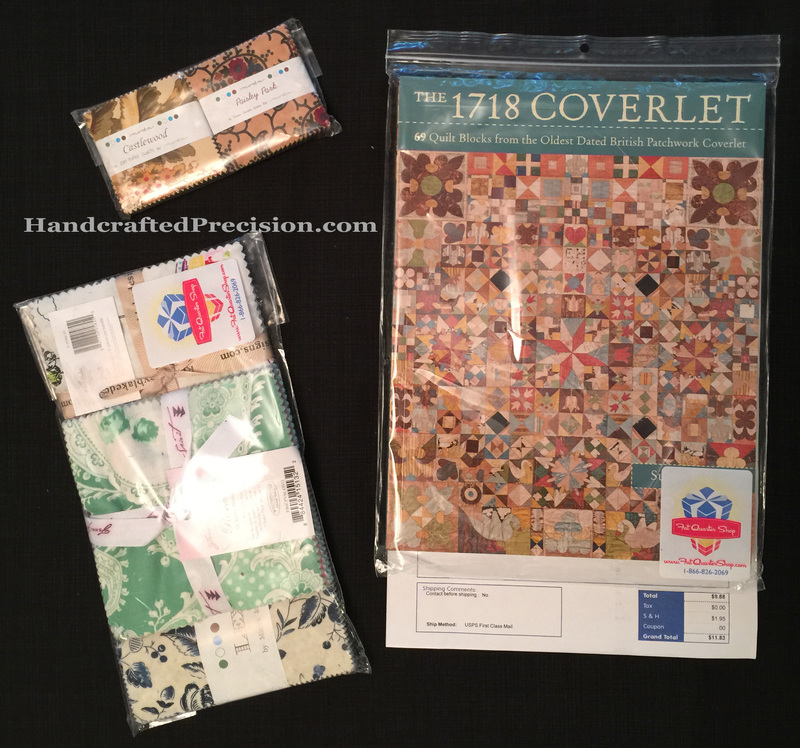 The downsides are that only Moda fabric lines are included and that I won’t get any of those surprise old fabrics like when I beg or buy another sewer’s scraps. 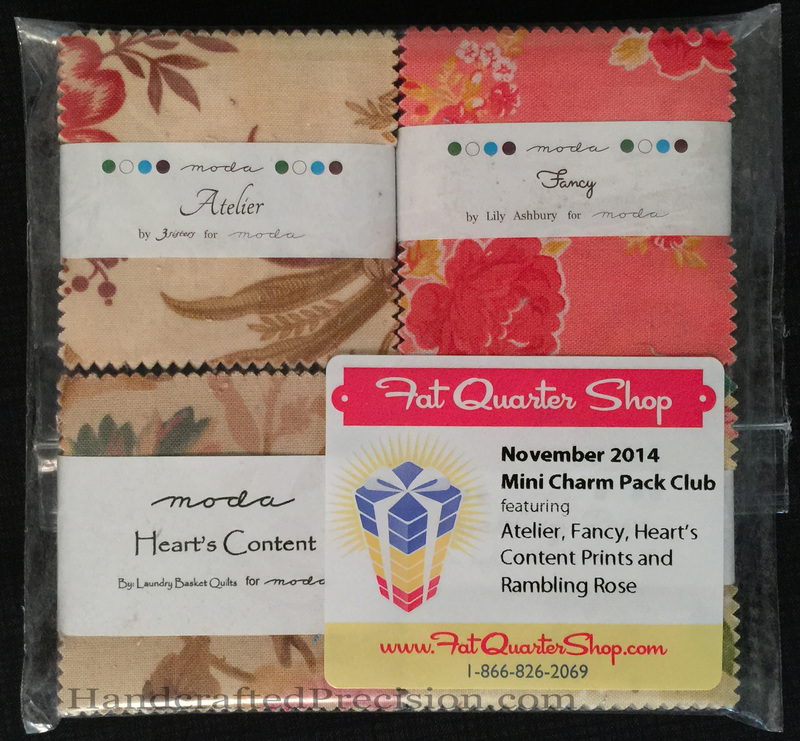 This entry was posted in Precuts, Stash and tagged Fat Quarter Shop on December 2, 2014 by HP.